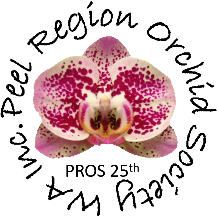 Welcome to the home of the Peel Region Orchid Society on the web. Meetings are held on the 1st Wednesday of each month except January starting at 7:30pm. They are held at The Parish Centre, 8 Stevenson Street, Mandurah . You can participate in friendly orchid talk, listen to an expert speaker and enjoy some light refreshments. The quintessential All-in-one reference for growing orchids in hot dry summers and cold wet winters!! Contact the club secretary to order your copy at AUD$10 (inc p&h within Australia). Use the Contact Form on the Contact Page of this website for enquiries.